Ben & Jerry’s Pitch: This pitch was completed alongside a pitch for the Magnum and Walls ice cream brands. Mainly working across social our job was to demonstrate how we would of celebrated the 35th Birthday of Ben & Jerry’s Ice Cream. We took the opportunity to thank the cows by planning a massive birthday party in their honour. 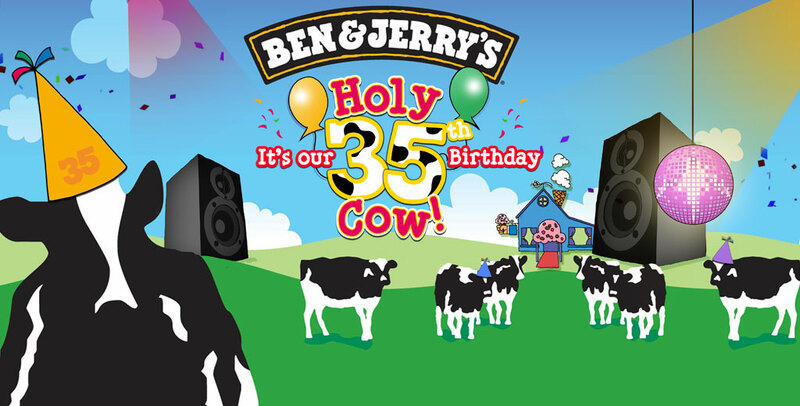 My involvement: Using the established look and feel of Ben & Jerry’s I created the key visual for ‘Holy Cow. It’s our 35th Birthday’. This was then used across example Facbook posts and other campaign materials. Additionally I created a set of topical limited edition Ice Cream tubs as a series of Reactive Pots that demonstrated our ability to respond to events in the media using the medium of Twitter.